Conventional Wisdom Says That Current Digital Cameras Are Much Better Than the 35mm Film Cameras They Replaced. Hmmm. The roofing project is over but I learned something interesting in the process that has nothing to do with roofing a house or a studio. I was taking large photos off the walls of our house to that the vibrations from workers dropping bundles of shingles on the roof wouldn't knock them off. The image above is a quick cellphone shot of a photograph that usually hangs in our bedroom. 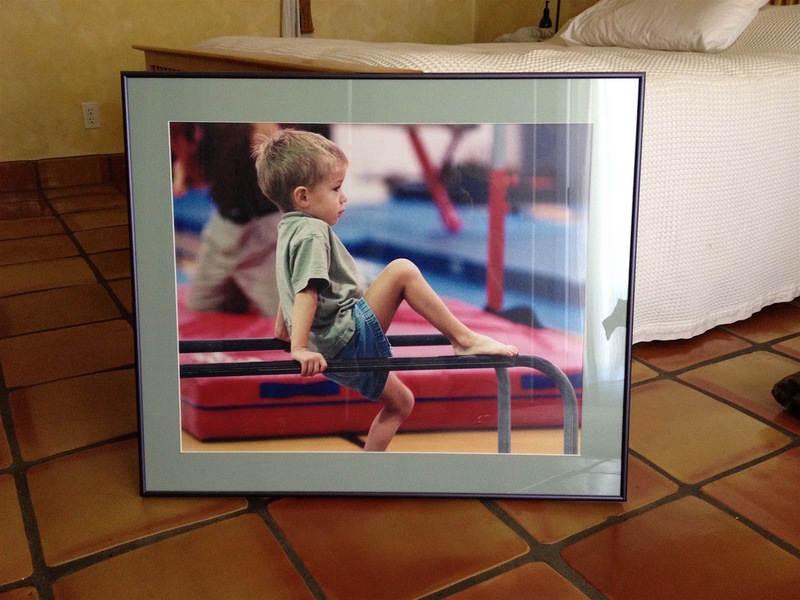 It's a photograph from a long time ago of our son, Ben, when he was only four years old and taking gymnastics. I shot it in a dimly lit gym on Kodak's Ektapress 400 color negative film. It was shot under a mixed lighting stew of vaporous daylight, sodium vapor and some fluorescent thrown in for good measure. Flash? Not allowed in the gymnastics area; it's too distracting for the athletes. I had my favorite lab take the 35mm negative and make their best quality 20x30 inch print of the image on a glossy, Kodak paper. When I took the image down on Sunday night I took a closer look at it. It's amazing that one gets used to seeing an image everyday and its qualities (beyond the emotional attachment) become invisible from familiarity. I hadn't really taken a good, technically cognizant look at the print in years. And in the decade+ since it was taken we've all bought into the idea that digital's capabilities have far exceeded what we were capable of doing with film so long ago. But my observation told me that the differences are not nearly as cut and dry as we might imagine. The print is very big. In it you can see every strand of Ben's fine hair clearly delineated. The flesh tone is perfect; even with all the mixed lighting. The background almost neutral. There is grain but it is diffuse and only really obvious in large areas of solid color. In short, I'd be happy with a print this good from my D750 or my D810 ---- but it would probably take me a lot longer to do the extensive post processing that would be required to match the tonality and character of the old print! Part of the quality of the image came from the way it was shot. It was the old days when "good enough" was not the reigning metric of our working methodology. I used a Leica R8 camera body coupled with a 180mm f2.8 Apo Elmarit Leica lens. It was shot wide open. I stabilized the camera and lens on an old, Leica monopod. I (manually) focused as carefully as I could and held the shutter button down for a three stop burst, thinking the the first shot would suffer from my initial finger motion but the second or third shot would be stable. When I cleaned the glass on the frame and took a really good, close view at the image what I realized is that what we've gained in the process of switching technologies is speed and convenience and very little more. We could say that we've gained "free" frames but the reality is that we've spent so much in our upgrade processes that we could still be buying film and processing and coming out ahead. I'm not saying we can go back but I am saying we did a lot of rationalizing to get to the point where we are today with digital imaging.... And we've paid a lot to get there. Where did we get to? About on par with ISO 400 negative film from 1998-99. Hmmmm.